Nice job sp. 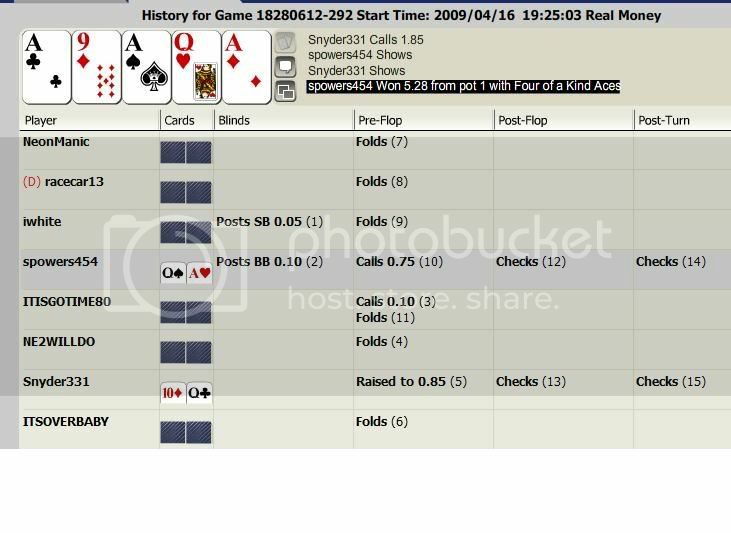 Was fun railing you the last hour or so. Lots of close calls. 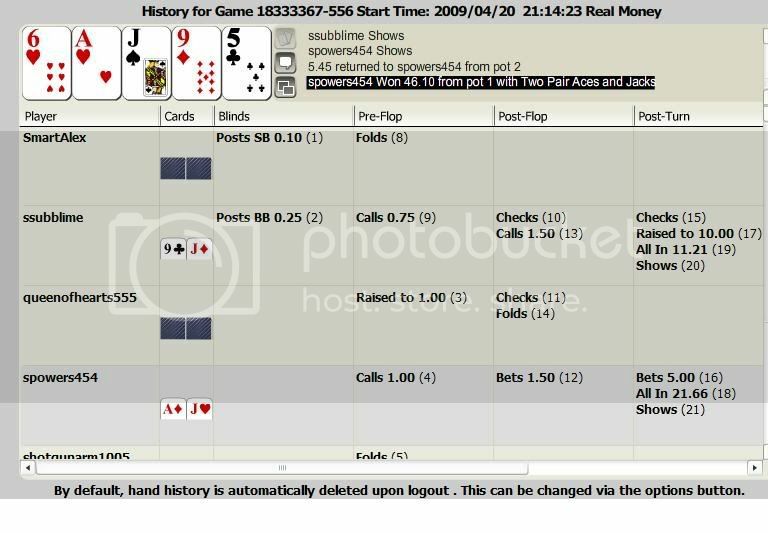 134 people in this one and got short stacked when it got down to four. 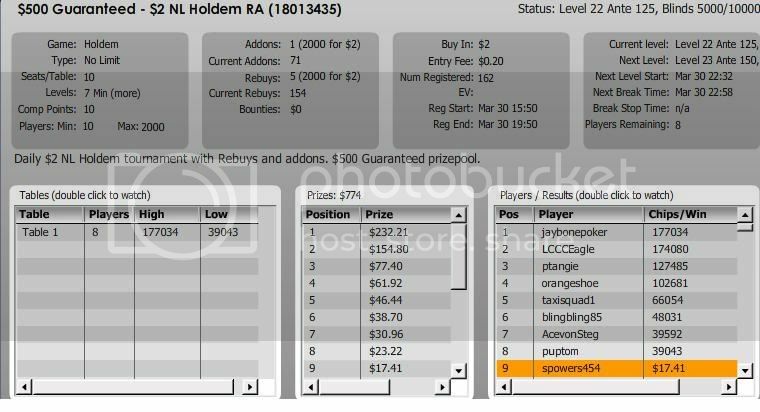 Held on and made it hu, still at a terrible disadvantage chip wise. Only had 11k left to his 284k. This is now my new biggest comeback heads up. 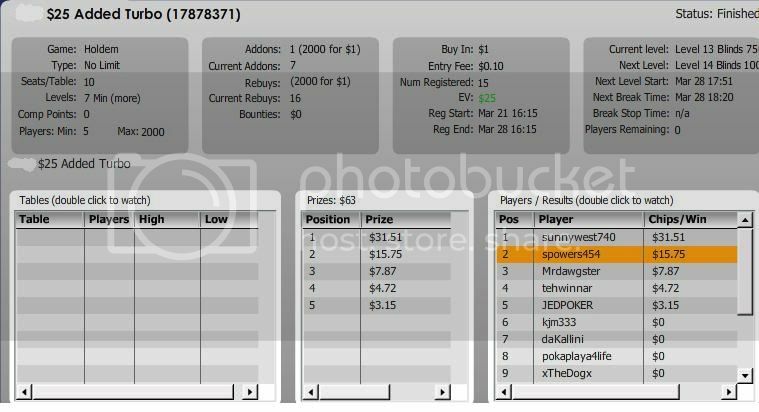 won a few bucks but got that 10k tic i was chasing. 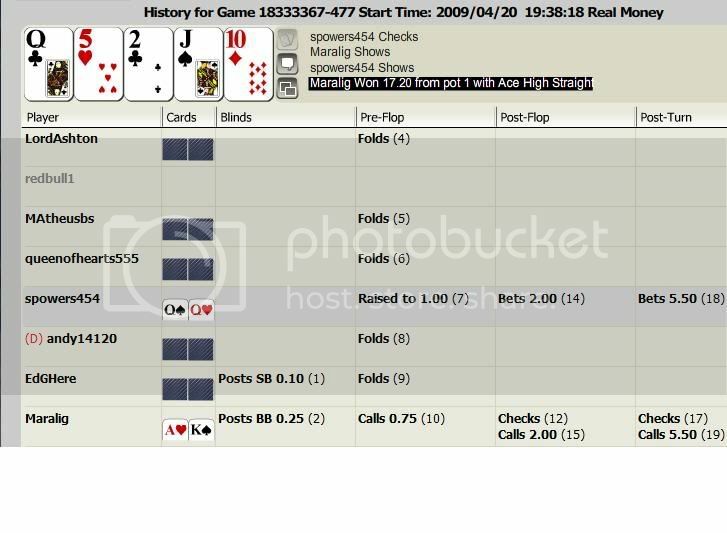 Getting donked is 40% of poker, donking others is 40% and the other 20 is when you get lucky and a great hand preflop holds up!! Wow! Nice little run there. Hope to see you soon in those games, but I need to build my roll a lot more. 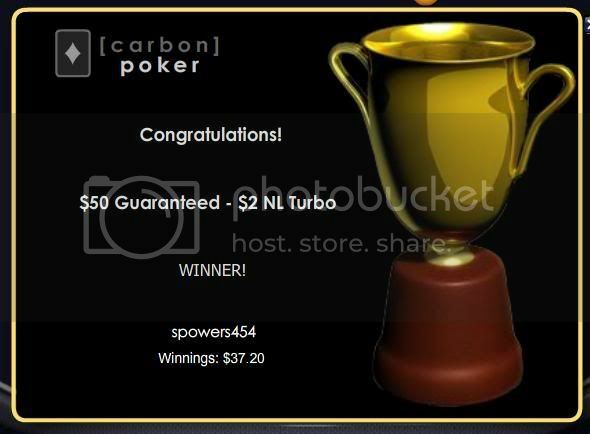 Well nothing big about this hand but my goal was to break $100 on carbon for free in less than a week, well i got within $15 but fell short and went the wrong way for a little while. After a few realy stupid moves as of late by me I may have learned to use my head and walk away before i regret it. 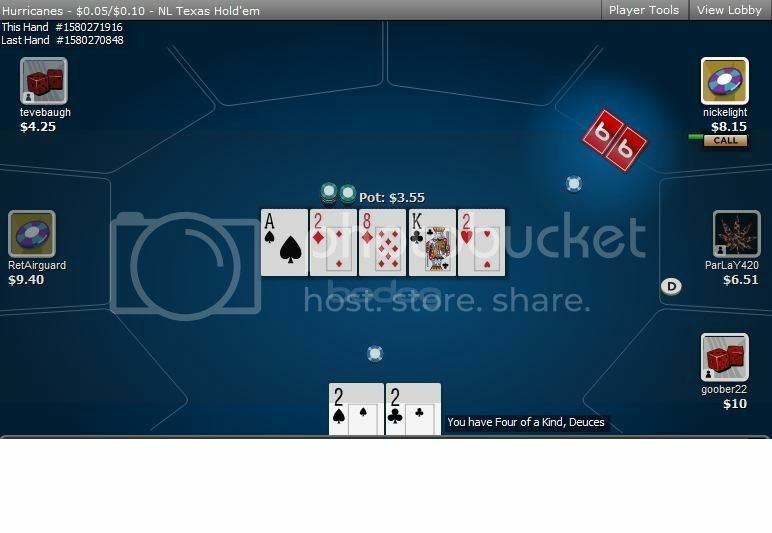 Even though it's a little late this is the hand I broke $100 on while at a .20/.10 cash table. 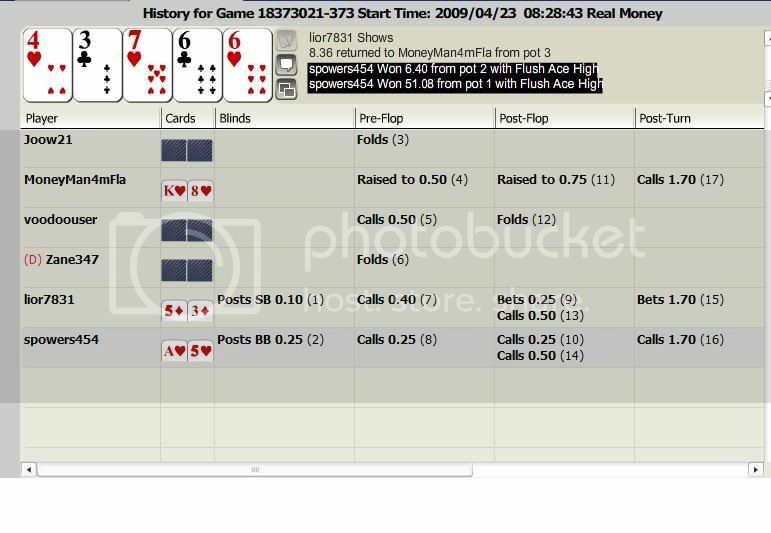 Most of the work was done for me when my aa held up against qq but this one put me over the top. Great job sp. Now are you going to get some sleep? Nice dude. Now to make a goal of 500 and break that! Keep it up. Adios Amigo. Who needs sleep? No time for sleep when there are so many fish with money that they just don't seem to want, someone needs to help rid them of that burden. 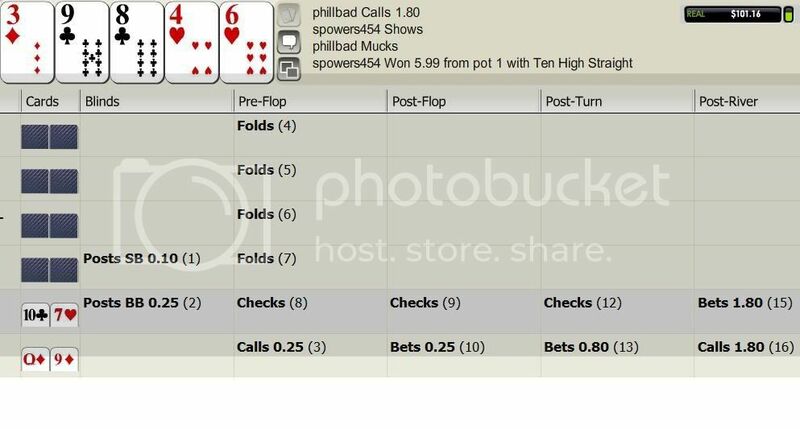 As far as making the new goal $500, with me the new goal is don't do anything stupid and blow it all in a day...... For so added fun, I started back playing on rummy royal after playing a few games on my moms acct. I decided I needed to get a mini-roll on there and see what happens. I deposited $10 got a deposit bonus of $15 and a free bonus of $5 so got to spend 10 and start my br with 30 hehe. I did this last night and in a day I'm at 57 lol. hope it keeps building that fast. I may have to leave poker for rummy lol. About an hour later finally got it all back plus a little extra for my troubles. My biggest pot so far. 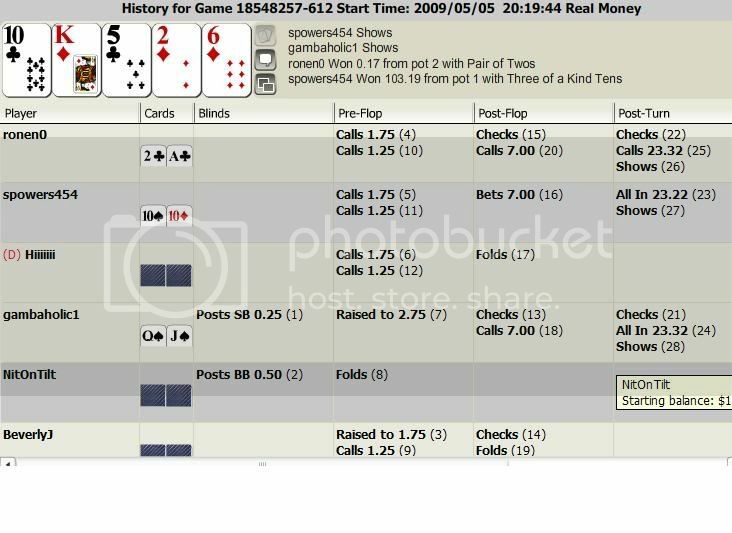 on that last hand what if ssubblime had been holding 78h and was chasin that flush but hit the strt instead. you must have known this player well enough to commit, since you only had the top pair. i would say you may have got paid but it was a big risk with that open hole and the fact you said this is about chasers sucking out on yah. just saying not picking your game apart. but hey you did win and the money is final conclusion in any game. 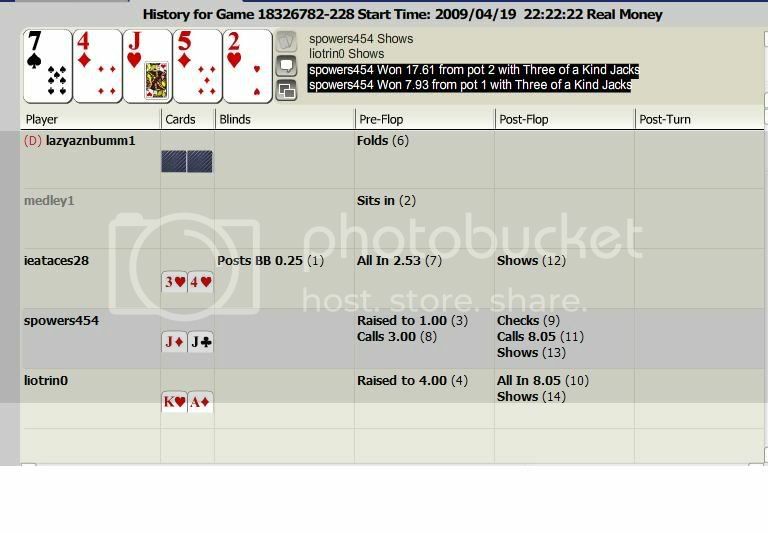 Well the guy with the 2nd highest flush was the table trash talker, one of those I'm better than everyone else people so had a blast taking his cash and the other guy was the table fish. Some poeple may feel bad about taking money from him he was sooooo bad, not me fck'em ship it. 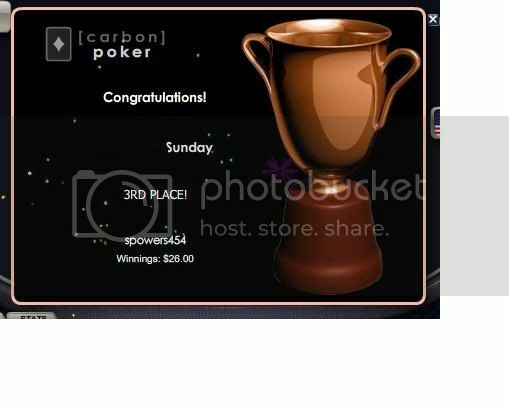 Anyways new biggest pot won by me on carbon figured I would share.